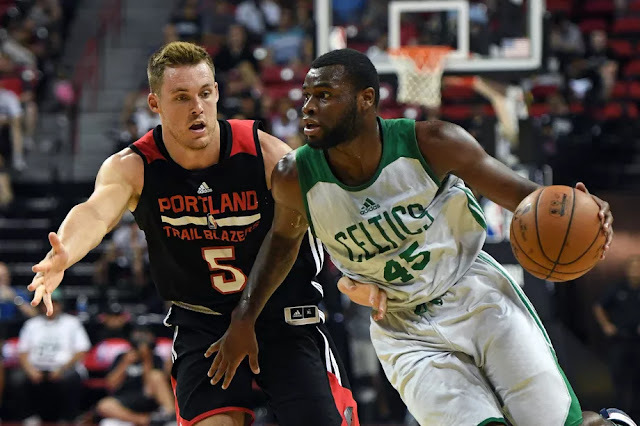 The Boston Celtics have announced the signing of Kadeem Allen to a two-way contract. The Celtics have signed rookie guard @AllenKadeem to a two-way contract. Allen, who was drafted by the Celtics 53rd overall in the 2017 NBA Draft, will take advantage of one of the two new roster slots created under the new collective bargaining agreement which allows teams to retain up t two players who will spend most of their time with an NBA G-League outfit, but who may also be called up for up to 45 days a season with the parent club, during which they will make NBA-scale pay. An alum of Arizona, Allen was a significant part of the same Wildcats team that featured Lauri Markkanen, Kobi Simmons, and Allonzo Trier, where he logged 9.8 points, 4 rebounds and 3 assists per game while shooting a scorching .427 from three. He'll make a minimum of $75,000 in guaranteed money, and depending on how many days he spends with the Celts, could earn as much as $250,000. No word yet who might be joining him on the other two-way roster slot, but I would guess the other late second-round draftee, Jabari Bird, a Cal alum with connections to Jaylen Brown, as the most likely candidate.